In oil markets, but with far broader implications, the focus will be on President Trump as a weekend deadline looms for him to make a unilateral decision on Iran that could lead to re-imposition of sanctions. Also with an eye on the energy future, carbon markets will be watching Brussels as EU officials meet Thursday in a bid to strike a final deal on a far-reaching overhaul of Europe’s Emissions Trading System. The steel market is assessing the fallout from the EU’s October 6 decision to apply fixed duties on imports of hot rolled coil from Brazil, Russia, Ukraine and Iran. Meanwhile, In petrochemicals, prices of polyethylene -- a key plastics component -- could rise this week as consumers return to the market, boosting demand. 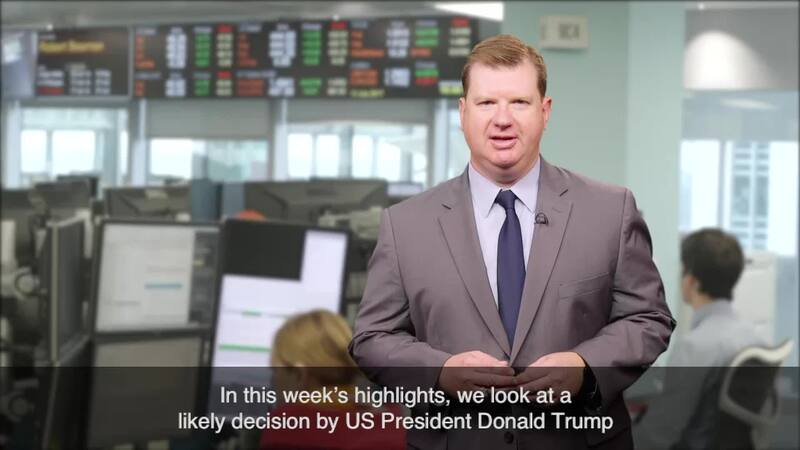 In this week’s highlights, we look at a likely decision by US President Donald Trump that could prompt the re-imposition of Iran sanctions, an expected carbon emissions trading overhaul from Brussels and the impact of new steel import duties by the European Union. Also closely watched will be the monthly market reports from OPEC, the International Energy Agency and the US Energy Information Administration, giving a snapshot of supply, demand and key stock levels – the main target of the OPEC/non-OPEC production cut deal. Also with an eye on the energy future, carbon markets will be watching Brussels as EU officials meet Thursday in a bid to strike a final deal on a far-reaching overhaul of Europe’s Emissions Trading System. Carbon prices surged to a 20-month high in September as key supply-tightening measures crept nearer to passing into law. A big question now is whether there is further upside for prices if the EU Parliament and Council agree the deal this week, or whether the recent rally is simply a chance to take profits. Moving from emissions to imports, the steel market is assessing the fallout from the EU’s October 6 decision to apply fixed duties averaging 57 euros a metric ton on imports of hot rolled coil from Brazil, Russia, Ukraine and Iran. Western European mills have already pushed up the domestic HRC market to 540 euros a tonne on a lack of imports, and will be looking this week to lock in even higher margins as they take advantage of protection provided by the new duties. Buyers will now have to decide whether to commit to higher domestic offers if alternative import options are curtailed. Our social media question is: Will duties push up European steel prices? Tweet us using the hashtag #PlattsMM. Steel users are not the only ones facing a test of their mettle. In petchems, prices of polyethylene – a key plastics component – could rise this week as consumers return to the market, boosting demand. European producer stocks remain low, limiting domestic supply. Coupled with low import volumes from the Middle East and US supply disruptions after Hurricane Harvey, this will put upward pressure on prices. Please take a few moments this week to check out Platts’ new container price assessments. You can view them on our new iPhone app—search for it in the App Store – or visit containers.plattslabs.com. Please share your opinion with us and suggest dry freight routes you’d like to see rates on in the future. Thanks for kicking off your Monday with us and have a great week ahead.